HANNIBAL – A mixture of academics, singing, acting and traditional Georgian dance filled the annual Hannibal High School Junior/Senior Talent Show. 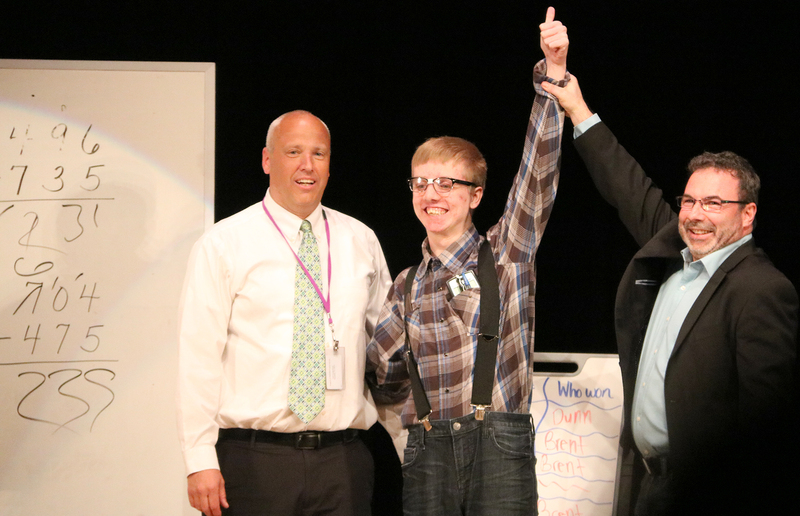 Talent Show emcee Victor Licatese, right, raises the hand of Brent Wiggins, who won a math challenge against Principal Stephen Dunn during the first act of the event. Ashley Mills opened the show with the song, “You’re Not There,” to which the crowd in the high school auditorium erupted in cheer. The skit, “Roommates” was performed by Abigail Kyle and Kiersten Lathrop, while the “Blood, Sweat and Tears” dance was performed by Taylor Felber. One of the show’s highlights came during the first act with student Brent Wiggins challenging Principal Stephen Dunn to a math challenge. Wiggins won the challenge by answering several of the questions correctly, using only his mind. Dunn, who was happy to participate, received a standing ovation with Wiggins from the judges and a few audience members. Two live chickens made a guest appearance during the “Chicken by the Tenders” song, by Emily Howland, Lacee Howland, Velvet Howland, Alice Lanning, Antoinette Lanning, Autumn Lanning and Hannah Svereika. The hilarious song, about a love for snacking on chicken, brought tons of laughs and smiles. Emcee and host for the event was Victor Licatese. Guest judges included Meyer and fellow teachers Kristina Licatese-Linn, Kathryn Oaks and guidance counselor Brooke Fingland, who scored each act on a scale of one to five. The entire senior class closed out the show by singing, dancing and performing air guitar solos to “Don’t Stop Believin’” by Journey. The event served as a fundraiser for the senior class.